Conductors like Rinaldo Alessandrini have done a great deal to put Italian music-making, particularly Italian singing back on the map. For many years one could pretty much rely on any choral recording made in Italy by Italians to be sub-standard. Such is no longer the case, but regrettably the improvements have not yet made it to Genova, as these performances, interesting as the repertoire might be, go to prove. 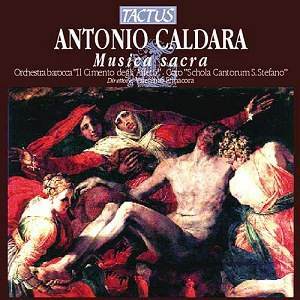 Antonio Caldara was greatly admired in his day, was a fluent and prolific composer and was recognized over a wide span of Europe, with even J.S. Bach making use of his music for services in Leipzig. This collection of sacred choral and instrumental music is somewhat hit and miss in quality, and is sadly done in by the almost universal inferiority of the soloists. Opening and instrumental sinfonia, a meditation on the death and burial of Christ, the disc gets off to a hopeful start, at least in terms of the quality of the music. There is much drama in the score and the colorful harmony, tense with chains of suspensions is gripping. Unfortunately, the "Il Cimento" orchestra has not yet learned to play baroque strings consistently in tune, and this flaw very quickly detracts from the music�s enjoyment. The mass is rather typical of the sort of utilitarian baroque mass settings that seemed to flow from composers� pens like water in those days. It is elongated by the common practice of setting the longer Gloria and Credo in strings of shorter, independent movements instead of making them through-composed as was the practice in the renaissance. Before the final Dona nobis pacem, Caldara seems to be doing a bit of note spinning, and the ideas are few. Fond of fugal writing, he tends to get carried away with the length of things. The disc concludes with a nice little set of motets for two and three solo voices with continuo. These show a good deal more invention, perhaps because the texts are more diverse and lend themselves to more colorful settings. This disc had potential to be quite a find. Regrettably, however, the soloists bring the enjoyment of the performances to a crashing halt. The sopranos in particular simply do not have a pleasant tone between them. Of late I have been railing against bad counter-tenors, and this one gets added to my list of singers who should go back to the baritone range. The choral singing is out of balance and there is practically no unity of tone. In particular the altos have a strident and abrasive sound that gets into your face pretty quickly and never leaves. I am beginning to think that it is simply too easy to make a recording these days. Although there are many well meaning performers and ensembles, far too many discs of what could be very interesting music are derailed by consistently inferior performances. Sadly, that is the case here. Pass on this one. Wait for the Dutch to do it right!